Our free 'Valentine's Day Update' ❤ 💾 that adds cool additional new features for version 2018 for all users of tlTerm Terminology software, TLex Lexicography software, tlCorpus etc. is now available. Current users can get the update* by simply using the usual methods for installing updates (e.g. the "Help/Check for updates" menu). NB: Please note that all Word/Excel-related functionality is unfortunately available for the Windows versions only. 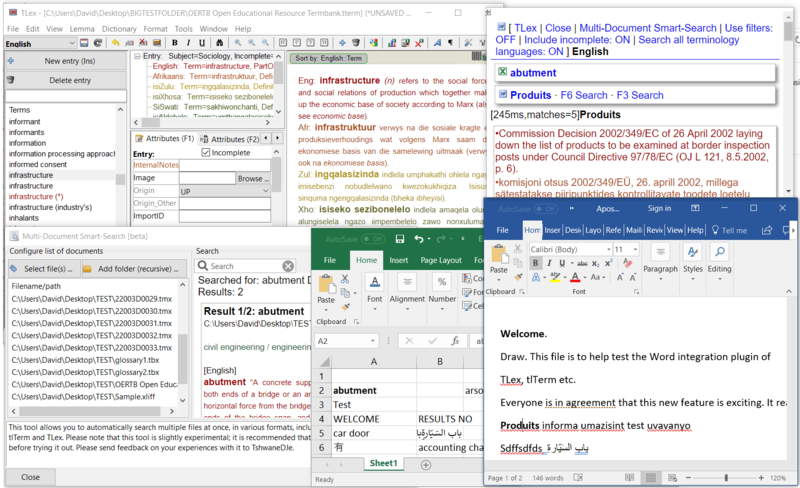 The screenshot shows upgraded Microsoft Word integration functionality, new Excel integration, and also shows (in the new Multi-Document Smart-Search [available in TLex and tlTerm]), amongst others, auto-searching in TMX files (Translation Memory eXchange, here using EU science hub open TMX files for demonstration purposes) and TBX/XLIFF files, and also shows the OERTB 11-lingual South African Open Educational Resource TermBank within tlTerm. 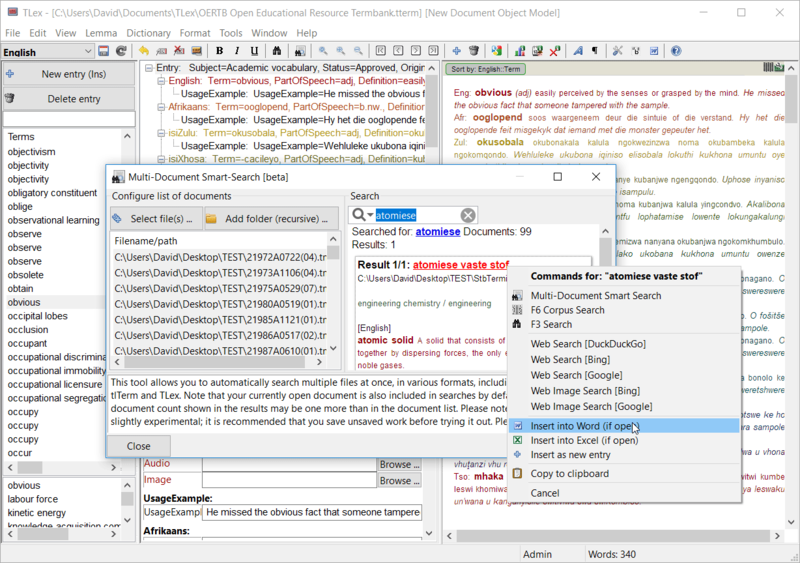 To open the Multi-Document Smart-Search, you can select it from the File or Edit menu, from the toolbar, or from the useful new 'general text commands menu' that is also integrated with this, as well as in various other places throughout the software. Other new features in this update include some improvements/fixes to Right-to-left language support (e.g. Arabic/Hebrew), new 'always on top' window options for TLex/tlCorpus/tlTerm/tlDatabase, 'installable Lua plugin filters' under your Documents folder, new 'paragraph styles' option in the RTF export, new Word and Excel integration in tlCorpus [Windows only], a new 'Tools/Take screenshot' command [Windows only], new "Window/Previous window or tab (Ctrl+Shift+F6)" command, new detailed technical 'document memory usage statistics', and fixes to the built-in localisation editor to allow custom .lang files to be saved under your 'Documents' folder. For a detailed list of changes, see the ChangeLog. Q: How can I tell if I have the update? A: In your software, select "Help/About" from the menu, and look for the "Build date" - if it is newer than Feb 14 2018, you have the update. Q: How can I get the update? A: *Unless you have been instructed to use a special build of our software (e.g. certain clients), then you can use "Help/Check for updates" to be directed to the latest installer. Or, just go to our downloads page, select the relevant software that corresponds to the license you own, and download and run the latest installer - it includes all the latest updates.